There are many types of posts people make on social media, and virtually everyone has seen the most popular categories of posts. There are the political posts, which can be stressful. (In fact, a recent study from the American Psychological Association showed that many of us experience the preponderance of political posts and discussions we encounter to be a significant stressor in our lives.) There are the "humble brags," which can be humorous, but also stressful. (Again, this research shows that the social comparison that’s facilitated by social media can be a real source of stress and can make us feel bad about ourselves as we compare our regular lives to the best versions of others’ lives, which make up the majority of some people’s posts.) Discussions can turn into conflicts and many posts can feel stressful to read, even if we don’t realize it at the time. Much of what we spend our time reading on social media can make us feel more stressed and drained rather than less so. And then there are the posts that show pictures or videos of cute animals. This is the type of post that you’d expect your sweet aunt to post, or perhaps your friend who’s an extreme animal lover. This is also one type of post that is often underappreciated and seen as lacking in importance and substance. However, perhaps we should all be spending more time looking at these uplifting videos. Some research suggests that they can not only lift our moods but help us build resilience to stress in the long run. If that doesn’t have your attention, it should. 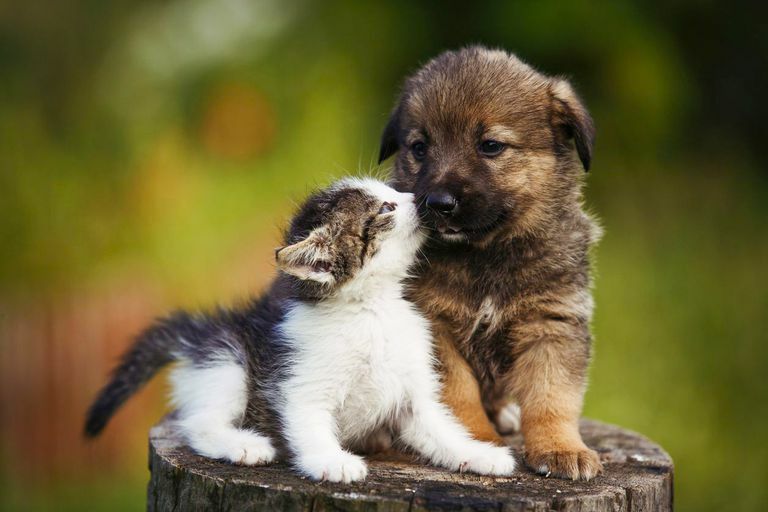 Animal Photos and Marital Bliss: One study led by James McNulty of Florida State University found that they could improve marital satisfaction with the use of cute animal photos. More specifically, they took 144 couples who had been married for less than five years and had them complete marital satisfaction surveys. Then they asked them to view to view a stream of images three times a week for six weeks. Those in the experimental group always saw a stream of images that included their partner paired with visuals of cute animals or words like, “wonderful,” while the other group saw pictures of their partners paired with neutral objects like buttons. After six weeks, the group with the cute animals paired with their spouses had more positive automatic responses to their spouses. Additionally, they demonstrated more satisfaction with their marriages, and improvements that came to a higher degree than those in the control groups. These findings even surprised the researchers but showed that there is a real potential benefit to viewing pictures of cute animals and that this can help people to feel more positively about other things (and people) in their lives as well. Mood Lifts and Resilience to Stress: Another series of studies by researcher Barbara Fredrickson found that by lifting one’s mood—something known as “inducing positive effect,” people can broaden the range of options they see in their lives, leading themselves to become more aware of potential resources available to them and to build upon those resources. This process can lead to more positive moods, greater resource-building, and, in essence, an “upward spiral of positivity” that leads to greater resilience to stress, among many other things. (Research has found that many things are linked in this upward spiral, so it’s highly beneficial.) This can all be triggered by virtually anything that gets us into a more positive emotional state, but cute animal visuals seem to fit that bill. Videos Are Great Mood-Changers: Finally, in the world of positive affect-induction (what led to resource-building in Fredrickson’s studies), researchers have been studying which techniques work the best. They’ve found that gratitude journaling can lead to increases in positive affect, as can visualizations of good things happening to us, loving-kindness meditations, and many other things. Positive videos have been found to be one of the strongest good-mood-inducers, however. One review of several studies found that videos had a stronger effect on mood than music or several other mood-induction techniques. This means that videos of things that lift our mood—and cute animal images have been found to do this—can lead to these “upward positivity spirals” and the life satisfaction and resilience to stress that they bring. This makes them well worth the time it takes to watch them, at least in moderation. Cute Animals Boost Productivity: OK, back to research on animal videos in particular. A Japanese researcher named Hiroshi Nittono found that study participants who looked at pictures of puppies and panda cams, as well as grumpy cat videos, experienced not only mood boosts but increases in their productivity as well. In the study, subjects performed several tasks that required skill and concentration (including the board game, “Operation”) before and after viewing pictures of baby animals, adult animals, and neutral items like food. Those who viewed the cute baby animal pictures performed significantly better than the other two groups after the viewing. It was thought that the rise in productivity was due to a few factors including the mood lift (which fits well with the previous research by Fredrickson), and the fact that the videos helped subjects to narrow their focus. So while the enjoyment you find in viewing videos of cute animals can be its own reward, many people may be reluctant to share these videos because they may seem unimportant compared to more serious or ego-enhancing content we could be putting out there. Some people may feel it’s a waste of time to watch the videos when more important things are happening in the world. But stress management and emotional self-care are very important for our ability to not only function well in our lives but to be resilient enough to be there for each other. That makes this “fluffy” pastime perhaps a little less frivolous. In addition to watching videos of cute animals, there are other ways to boost positive affect and let the mood boost give you a life boost. The following have been found (by some of the research mentioned above) to give you a boost in mood as well. You can try these activities in addition to watching animal videos, or sometimes when you have no cute animals handy. You can never find too many mood boosters. Gratitude Journaling: At the beginning of your day, list three things for which you are grateful. You can also do this at the end of the day, listing things that happened that day or people you saw that provoke a sense of gratitude. You can elaborate as much as you like, but even a brief list can help you to feel better about your life and give you a lift in mood that you can carry with you throughout the day. Positive Visualizations: One study had participants spend four minutes visualizing positive events happening to them. They can either be good things that happened in the past or fantasy events like winning the lottery. The four minutes can be spent imagining in detail how you felt when this happened, or how you would feel. Remember or imagine sensory details, emotions, and what happens next. There are other ways to boost your mood (exercise, seeing a good friend, even enjoying a cup of tea), so experiment away. This is a great list to start with, however, and it’s a great idea to incorporate these things into your daily life. And cute animals can be the first thing you try. Fredrickson, Barbara L.The role of positive emotions in positive psychology: The broaden-and-build theory of positive emotions. American Psychologist, Vol 56(3), Mar, 2001 pp. 218-226. Ferrer, Grenen, and Taber. (i2015). Effectiveness of Internet-Based Affect Induction Procedures: A Systematic Review and Meta-Analysis. Emotion, 15 6, p752-p762, 11p.